Caprara was the most populated center of the territory. Until the end of the 1800’s it was the seat of the municipality and therefore a central point for the whole area. 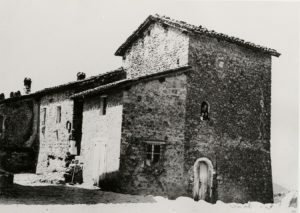 In the period that is of interest for us, the official municipality was in Marzabotto, but Caprara remained the central meeting point for the people who lived in this area: there was a pub, the shops, and the kiosk, there were parties and fairs; also situated near Caprara was the most important water fountain in the area. What are the reasons behind that kind of brutality and aggression? What does “brutality due to war” mean? Is that the only reason? Was/is it possible for people to disobey orders? What were those who did this thinking? In what situation were they in? What does it mean to talk about conforming both in war and in everyday life? What does it mean to make a different choice? Where were the partisans? Why didn’t the Nazi soldiers go into the woods and flush the partisans out of their hiding places, but instead stopped in the villages to massacre civilians? In addition to the fear felt by the victims, can we talk about the fear felt by the perpetrators? What kind of fear would that be? How does it differ from the fear felt by the victims? Can we talk about constructing fear with regard to this type of massacre? How do you interpret the meaning of these visual elements in relation to this site? What method of memory do they use? Can memory be layered? What comprises the layers? How can you differentiate them? How could a memory site be arranged to give equal importance to all the layers of memory that have accumulated over the years?